Apparently, staying at home is proving to be more work than going to work. And somehow, more time at home means less time overall. Still trying to make sense of that but really enjoying being at home. This month I'm ramping up for a few projects though; the first of which was a cake for my son's first birthday. This cake took me .... um, all day long. I almost started regretting it as soon as I got into the third animal but I decided to press on. This cake is from Debbie Brown's 50 Easy Party Cakes which is probably a very misleading title for this book but I guess they are easy compared to the cakes in the rest of her books (of which I have purchased none because the "easy cakes" are still proving very challenging for me). This is the first cake I've made that we decided not to cut and serve during the party as we were having more family visiting the next day and we wanted it to have a longer viewing life. Really, it doesn't make any sense not to cut it. It is a cake and what good is it if we can't eat it. But since fondant does preserve so well, we'll probably be cutting into it soon [squirm]. I soooo agree. People that don't stay at home don't understand. I just started staying at home and don't understand where the times flies. 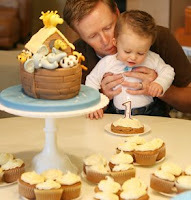 Almost forgot....how ADORABLE is that cake?!? this is just precious!! 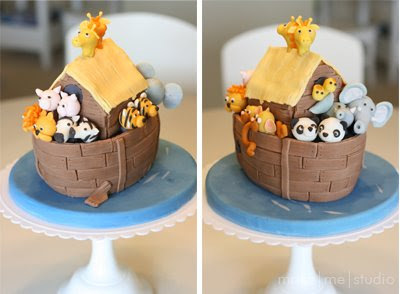 i'm thinking of making this for a friend's little girl's 1st birthday... i think i'm going to regret going down this path haha! but it's just too cute not to try!